Join St. Elizabeth Ann Seton Catholic School for this evening of games. Help raise money for the teachers fund and school trips. Do you like black jack or how about roulett? Or maybe you just want to be formal for one night and enjoy a great atmosphere. Will then this is the event for you. With authentic casino games and employees you will be helping our community raise money to continue educating our children without any worry of where funds might come from. 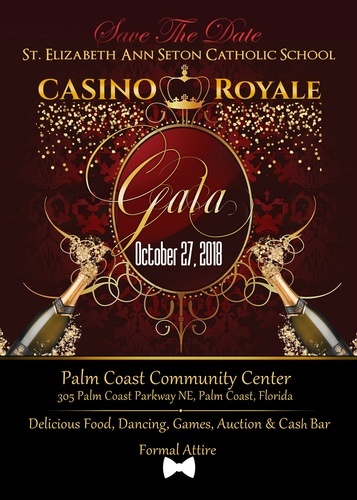 There will be delicious food, dancing, games, an auction and a cash bar. This is a formal event. Let's turn some heads, have fun and do something good for the school. To avoid paying more for the event by your tickets now before October 6th for only $50. After that price does go up. For more information contact St. Elizabeth Ann Seton Catholic School (386) 445-2411.